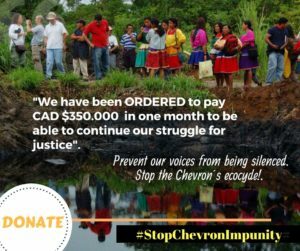 Position of the “Global Campaign to Reclaim Peoples’ Sovereignty, Dismantle Corporate Power, and End Impunity” in relation to the decision of the Court of Appeals of Ontario, Canada, against UDAPT, obliging it to pay U $ 270,000 to the Chevron lawyers. The case of Chevron vs. the Peoples of the Ecuadorian Amazon (UDAPT-Union of Affected by Texaco-now Chevron), impacted by the operations of this corporation more than two decades ago is a clear example of why we fight for an international binding treaty with respect to human rights and transnational corporations (TNCs). This case is an example of the extreme asymmetry between the TNCs whose operations result in violations of human rights and the peoples who are victims of such violations. Chevron, is a corporation that has so far invested more than US $ 2 billion, and has hired more than 2,000 lawyers to create a firewall whereby it can evade its responsibility. UDAPT represents an indigenous people whose economy is subsistence in the Amazon and who have been obliged to roam the world to seek access to justice for 30,000 affected people by the operations of Chevron. An International Treaty must address this asymmetry of power and resources by promoting, for example, the total or partial exemption of costs for cases of public interest and contemplating legal assistance measures that guarantee that the high cost of the process is not an obstacle to obtaining fair redress for those affected. The Campaign proposes options such as an International Center to assist these communities, and even the creation of a specific Fund that will contribute to the independence of action by affected communities. The main way in which the corporation has evaded the law is, according to the judicial decisions given (in the United States, Brazil, Argentina and recently Canada), is to argue that the various “Chevrons” established in different countries are independent companies and therefore they have no responsibility in relation to each other’s activities. Thus, violations caused by Chevron in Ecuador, cannot be attributed to the Chevron headquarters in the United States, or in any other country in the world. An International Treaty such as the one we defend must include the principle of “joint and and several liabilities”, which implies that, despite the legal autonomy of the subsidiaries in each country, the same, following common corporation strategies and commands, also share responsibility for their operations. This principle also applies to its suppliers and, within the corporation, to the different levels of management. Thus, the Argentina Justice system, for example, could easily attribute responsibilities to Chevron Argentina for the violations resulting from Chevron’s operation in any other country. In the absence of clear and efficient judicial cooperation mechanisms between different states – an extremely strict legal sovereignty is exercised in an increasingly global interdependent economy and in a planet whose environment is not divided into jurisdictions. Likewise, there is an absence of mechanisms of extraterritoriality that could facilitate justice whereby a state could judge the actions of corporations or of people that their nationals carry out in another country. Finally, there is currently no “universal jurisdiction” that enables judgement to be enforced on crimes carried out in any part of the world. In this context, the transnational corporations dodge and evade the national justice systems and remain unpunished. Therefore, the case of Chevron, which claims to ignore the decision of highest court in Ecuador – its Supreme Court – which in 2013 ordered Chevron to pay US $ 9.5 billion to repair the social, cultural and environmental damage inflicted on Nature and the affected Amazonian peoples – is a clear example of this evasion of responsibility. An International Treaty must put in place these mechanisms of cooperation between jurisdictions (for example, the creation of a specific International Court) and explore the principle of extraterritoriality as a way to prevent transnational corporations from escaping justice, remaining unpunished and preventing those affected peoples and victims access to justice and reparation. In 2015, the seven judges of the Supreme Court of Canada reached a unanimous decision accepting the jurisdiction to conduct the ‘exequator process’ in Canada, upholding the legitimacy of the Ecuador Supreme Court decision on Chevron. This gave strong hope for justice to the UDAPT indigenous communities. However on May 23, 2018 the Court of Appeals of Ontario has rejected the demands of the UDAPT and ruled in favour of Chevron. The decision is based on the argument that Chevron of Canada is a separate company independent from the Chevron headquarters in the United States and therefore has no obligation in relation to the decision made by the Ecuador justice system. This represents a heavy blow to the UDAPT indigenous people who, according to this Canadian Court decision, must now collect within 40 days, the equivalent of US $ 270,000 as fees to be paid to Chevron’s lawyers and the Canadian Justice system. This is the only way they will be able to continue the legal process to obtain redress in the Canadian Courts. Not only are they denied justice, but they are also penalized exorbitantly by this decision in favour of Chevron. We protest the consolidation of this situation of injustice and impunity before the UN through its Human Rights Council and international public opinion. We therefore urge States to progress consistently in the negotiation of a binding International Treaty on transnational corporations and human rights and we call for a strong international solidarity with the Amazonian communities affected by Chevron.